Michal saves her husband David from her father Saul (Gustave Doré, 1865). Michal (Hebrew: מיכל) was a daughter of King Saul and the first wife of King David in the Hebrew Bible. Her story is recorded in the Book of Samuel. Michal had fallen in love with David when he was still a young commander in King Saul's army and became David's wife after he proved his worth to Saul by killing 200 Philistines. She loved him at the risk of her own life by helping him escape when Saul sought to kill him. However, when David was forced to become a fugitive, her father required her to marry another man, Paltiel son of Laish. Many years later, during a civil war with Saul's son Ishbosheth, David caused the northern military chief Abner to bring Michal back to him when Abner wished to switch sides and join David's forces. The Bible does not make clear how Michal felt toward David at this point. Later, she took offense at David's near-naked dancing in public as he brought the Ark of the Covenant to Jerusalem. After Michal scolded David for this act, the two became estranged, and she had no children. In modern times, Michal has served as an example of romantic love, an archetype of feminine heroism, and as evidence for the oppression of women in a patriarchal age. She follows the example of numerous biblical women whose willingness to put themselves at risk protected the lives of key providential leaders. 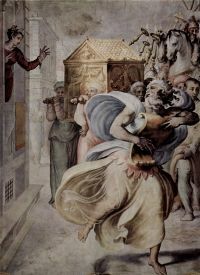 Michal is introduced in 1 Samuel 14, where she is identified as the daughter of Saul's wife Ahinoam and the younger sister of Saul's first daughter, Merab. She grew up during a period of instability in which the 12 tribes of Israel were beginning to form a federation that would eventually become a more or less cohesive nation under her father's leadership. "All the days of Saul," says the biblical author regarding the period of Michal's childhood and young adulthood, "there was bitter war with the Philistines." (1 Samuel 14:52) Saul also won important victories over the Amalekites, but lost the crucial support of the prophet Samuel for not being thorough enough in destroying them. Michal's future husband David first appears on the scene when the Israelites and Philistines face each other at the Valley of Elah, where the still adolescent David famously slew the giant Goliath. He quickly became Saul's favorite and formed a close alliance with Michal's brother Jonathan as well. David soon proved to be a capable soldier and was made one of Saul's military captains. However, his popularity also made Saul suspicious, and the king began to view David as a threat. Nevertheless, Saul offered David the hand of his elder daughter, Merab in marriage. Pleading humility and poverty, David demurred. Later, Saul learned that Michal was enamored of David and gave him another chance to marry into the royal family. His motive for this, however, was not entirely pure, for "an evil spirit from the Lord" sometimes came over the king and moved him such depression and jealousy that he wished to kill David. 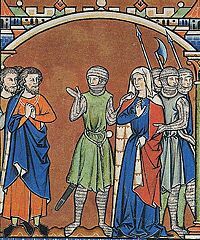 Thus, when David again pleaded that he was not wealthy enough to marry a royal daughter, Saul, feigning generosity, informed him that the bride-price for the marriage would involve no money, but would consist of David's bringing Saul 100 Philistine foreskins. The narrator's view is that Saul intended for David to be killed in the resulting battle. David, however, returned with not 100, but 200 foreskins of the Philistines he had conquered. Having received this grisly present, Saul indeed gave Michal to David in marriage. Michal played a heroic role in the ensuing saga. The evil spirit from God again came over Saul, this time causing him to attempt to kill David directly. In one famous incident, Saul tried to spear him while David was playing his harp. Saul next sent men to David and Michal's house. Knowing of her father's intentions, Michal risked her father's wrath to warn David. "If you don't run for your life tonight," she informed him, "tomorrow you'll be killed." 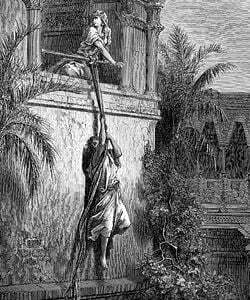 To escape detection from Saul's spies, she let David down through a window, allowing him to make good his escape. She then made up David's bed to appear that he was still sleeping in it. When Saul's men attempted to enter the house to capture David, Michal bought more time for him by telling them her husband was ill. Finally when Saul learned of her trick, Michal claimed that David had threatened to kill her if she did not help him. Whether Saul believed Michal about this is not clear. In any case, while David was in hiding, the king gave Michal as a wife to his ally, Paltiel son of Laish. During the ensuing separation, David himself took several other wives, notably including Abigail, the widow of Nabal, whose wealth in cattle greatly aided him and his band of renegades. However, pursued by Saul, David eventually joined his forces to the Philistines until Saul and Jonathan were both killed at the battle of Mount Gilboa, after which David was anointed King of Judah. Abner (center) separates Michal from her second husband Paltiel and brings her back to David. Michal despises David as he dances. The northern tribes remained loyal to Saul's son Ishbosheth. After years of civil war, David received an offer from the northern military commander and Saul's former captain, Abner, to defect to David's side. To prove the sincerity of this offer, David required him to bring Michal with him when he came to David's capital of Hebron (Jerusalem still remained in the hands of the Canaanite tribe of the Jebusites at this time). Ishbosheth, apparently believing that Abner did not mean to betray him and perhaps seeking peace with David, agreed to let Michal return, on the grounds that David had never divorced her and that he had duly paid for her with the blood of 200 Philistines. A pathetic scene followed in which Michal's new husband, Paltiel, followed weeping after her for miles, until Abner commanded him to go back home (2 Samuel 3:14-16).Although it is apparent that she was much loved by her new husband, we are not told Michal's feelings during all this. A later part in the narrative implies that she and Paltiel had no children. Michal does not appear again in the narrative until after Ishbosheth was assassinated and David had secured the support of a large part of the northern tribes formerly loyal to Saul. After finally conquering Jerusalem, David made this fortress city his new capital and brought the famous Ark of the Covenant, which also served as the throne of Israel's invisible deity, to reside there. In joyous celebration of this event, David "danced before the Lord with all his might." The narrative says nothing about the probably strained relationship that existed between David and Michal before this point. The sweetness of their young love had obviously soured during their years of estrangement, Michal's marriage to Patiel, and David's marriages to his several other wives. The story of Michal ends with the sad comment: "Michal daughter of Saul had no children to the day of her death." To modern readers, Michal's story has two contradictory themes. It can be viewed as a tale of heroic young love, in which Michal is the protagonist, saving the mighty warrior from her own powerful father. But it can also be seen as a lesson exemplifying the hopeless trap into which women in patriarchal societies inevitably find themselves. Michal, unwilling to live by the rules of her father, risked her life for her true love, David, only to be forced into a marriage with another man after saving David's life. Later, David treated her as property, which in fact women were at the time, by having Abner return her to him years later, regardless of her own wishes. And finally, when she dared to express her feelings of bitterness toward David, he simply stayed away from her, content with his other wives and leaving her childless, as she lived out her days away from her native land and family. Looked at in a more positive light, Michal followed the pattern of several other great biblical women by risking her life to save a man whom the Bible describes as chosen by God for a providential mission. Just as Sarah protected Abraham by deceiving Pharaoh, Rebecca protected Jacob by deceiving her husband Isaac, Rachel deceived her father by stealing and hiding his household gods, and Tamar safeguarded the Jewish lineage by deceiving her father-in-law Judah, so Michal saved the life of the future King David by tricking her own father, regardless of the consequences. Despite her later difficulties with David, she will always be remembered for being David's first love and for her heroic act of saving his life at the risk of her own. and like you doomed to love a man whom I despise. "Michal" had hardly ever been used as a name in pre-Zionist Jewish communities, but it was one of the biblical names embraced by Zionism and has become a common female first name in contemporary Israel. ↑ "Then Michal took a teraphim and laid it on the bed, covering it with a garment and putting some goats' hair at the head." (1 Sam. 19:13) The word "teraphim" is uncertain. It is the same word used to describe the objects taken and hidden by Rachel from her father Laban and is usually translated as "idol" or "household god." ↑ David's action is an apparent violation of Deuteronomy 24:1-4, which prohibits re-establishing a marriage with a previous spouse who has subsequently remarried. The fact that David, who is often cited as particularly scrupulous in his obedience to the laws of God, appears to be oblivious to the Deuteronomic code is cited in support of the widely held theory that Deuteronomy was written well after David's time. ↑ See 2 Samuel 6:23. However it may be that "no children" here refers to David rather than Paltiel. Fink, John F. Biblical Women: Females in a Patriarchal Society. Staten Island, NY: St. Pauls, 2008. ISBN 978-0818912627. Great Women of the Bible: The Wives of King David, Jezebel, The Shunammite Woman, Ester. A small-group Bible study series. St. Louis, MO: Concordia Pub. House, 2008. ISBN 978-0758615572. Haag, Herbert. Great couples of the Bible. Minneapolis, MN: Fortress Press, 2006. ISBN 978-0800638313. Rosenblatt, Naomi H. After the Apple: Women in the Bible: Timeless Stories of Love, Lust, and Longing. New York, NY: Hyperion, 2005. ISBN 978-0786869084. This page was last modified on 8 February 2019, at 21:22.